Marie's Order Board not updating? Somehow Marie's Order Board is not updated on my Farm. I am on level 30 and in a co-op.I reinstalled the game, used a forced close, rebooted the device, but nothing seems to help. Iphone device. We appreciate the steps you've performed to fix your concern, @rachel1492! 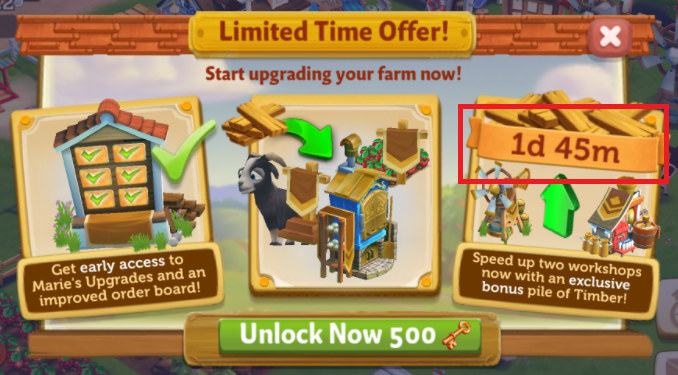 There should be an envelope on the bottom right side of your screen and check if there's a "Limited Time Offer!" notification message. You'll be able to see a countdown timer before you can use the new and improved Marie's Order Board. If you wish to have an early access, you may need to unlock the feature with 500 Keys. Otherwise, please contact Player Support for further assistance. Thank you!